For your request to be considered at the next meeting of the Professional Development Fund Committee, submit it by 8th April. 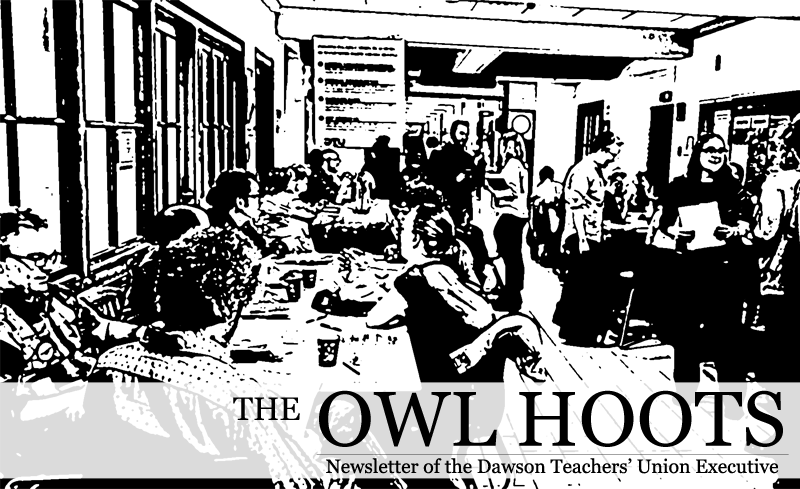 You can drop your application off at 8A.11 or email it to pdfsecretary@dawsoncollege.qc.ca. We ask that applications be submitted prior to the date of the proposed activity. 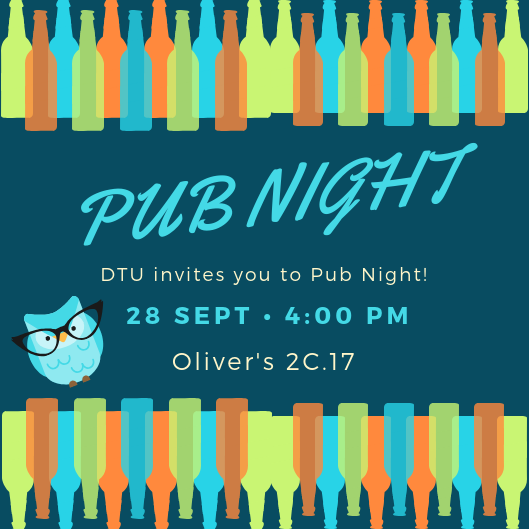 Come out to Oliver’s for the DTU Pub Night! We invite you to drop by our office in 8A.11. We can answer questions regarding workloads, seniority and priority, schooling and work experience documentation, and anything else related to working at Dawson. You can also call us at local 1799, or email us at dtu@dtu.qc.ca with any questions. The Executive Council are considering forming a committee of teachers to address environmental issues.The mandate of the committee could include raising awareness about environmental campaigns, promoting local initiatives, and mobilisation. If you are interested in getting involved, please let us know. She provided a link published the day before by a French group who called themselves ‘les enseignant.e.s pour la planète’. It was something about someone called Greta Thunberg and global warming. Then, that Saturday, I was absentmindedly scrolling down my Facebook feed and there was Greta Thunberg again: whatever she was doing with regards to climate change, she seemed to be doing it right. I looked her up, found her TED talk and listened. What followed was a very methodical speech, given by a 15 (now 16 year old) girl about how the time had come to engage in civil disobedience to save the planet. More specifically, she called on students to strike until such time as politicians finally take decisive action to prevent climate catastrophe. She’s right. Looking back at the link that my friend Violaine sent, it was a petition being circulated by French teachers in support of Greta Thunberg. The petition calls for teachers to properly explain the climate crises and support students in their strike efforts. We decided to launch our own petition, tailored for our Québecois colleagues. We called ourselves ‘Profs pour la planète’. Violaine contacted our French counterparts for permission to use their petition. She then did a superb job of adapting it to Québois audiences, in collaboration with Maude and Rafaëlle, both experienced activists in their own right, and Violaine put the petition on-line. With feedback from Mathieu, Sari and I helped in translating it to English. We all contacted our colleagues, then our friends working on environmental issues and in the media. We got a bit of coverage, deftly handled by Violaine. As of this reading, the petition has received over 4,000 signatures. opened up a Facebook group for our project. To date, more than 130 people have joined. In the medium to long term, we will join students for this coming March 15 strike, as well as the September 27 strike. We also hope to develop pedagogical tools to share with our colleagues, and do all that we can to represent teachers who have decided to support students and join the call for civil disobedience. The ‘Profs pour la planète’ petition is available online, and there is also a Facebook group. 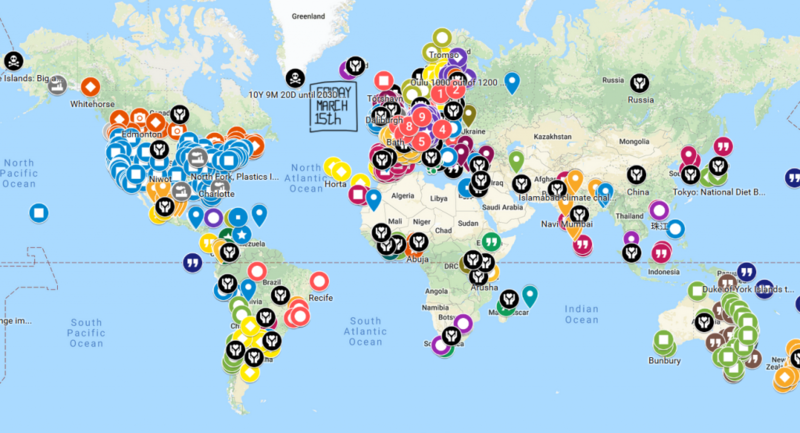 The Profs pour la Planète group will be meeting ahead of Global Climate rally on March 15th at 12:30 on the north-east corner of Parc and Duluth. Something is profoundly wrong with the way that we have come to live; in the divisiveness we have created between people, nations, animals and nature, and the way in which we continue to relentlessly damage the planetary home that sustains us. Recent dramatic weather events have heightened our sense of the fragility of the ecosystems that have sustained us, and whose resilience until recently we have taken for granted. As we approach the third decade of the 21st Century we are losing the stability of the earth systems that have allowed humans to thrive and flourish. We have in fact altered the structures and functioning of planetary systems to such a considerable degree that the International Union of Geological Sciences agreed in 2016 to change the name of this epoch from Holocene to Anthropocene, or ‘Age of Humans’. The world glimmers at night, thanks to our love affair with fossil fuels, the drivers of economic development, which have given us the power to transform our lives, and transform the world. The stars that inspired philosophers and scientists in the search for meaning are now largely obscured. We have failed to really grasp that the world has undergone radical change, and are only now awakening to the consequences of what some say is a huge out of control experiment on our ecosystems, our populations, our children and our future. Dramatic events in 2018 marked a turning point for many in the realisation of the significance climate disruption brings to their lives, and that even the wealthiest and most comfortable among us cannot be immune to extreme weather, fire or floods. A sense of loss, anxiety and ecological grief began to take hold in the spirits of many. Climate change has been called the greatest health threat of the 21st Century (The Lancet 2009), as the earth’s average surface temperature rises in synchronicity with unprecedented greenhouse gas emissions. Direct and indirect health effects result from extreme weather, water and food contamination, droughts, floods, insect-borne and other changing patterns of disease, temperature extremes of hot and cold, acidity of oceans, air pollution, biodiversity loss, and other phenomena. The most recent special report from International Panel on Climate Change warned of the catastrophic effects on ecosystems and human health in a 2°-warmer world. We also know however that deep evidence-based climate action has the potential for significant health benefits, and that actions designed to reduce greenhouse gases, dependence on fossil fuels, development of alternative energy and transport, have direct effects on human health and thriving. Happy New Year! We hope the new semester is off to a great start. As always, we invite you to drop by our office in 8A.11. We can answer questions regarding workloads, seniority and priority, schooling and work experience documentation, and anything else related to working at Dawson. You can also call us at local 1799, or email us at dtu@dtu.qc.ca with any questions. We invite you to join us for a General Assembly on Wednesday, 30th January in 5B.13 at 11:30am. Lunch will be served at 11:15am. The items on the agenda are Negotiations 2020, Religious Neutrality, and the Policy to Counter Sexual Violence. Members of the DTU Executive attended a Regroupement Cégep in Montreal on January 24th and 25th. 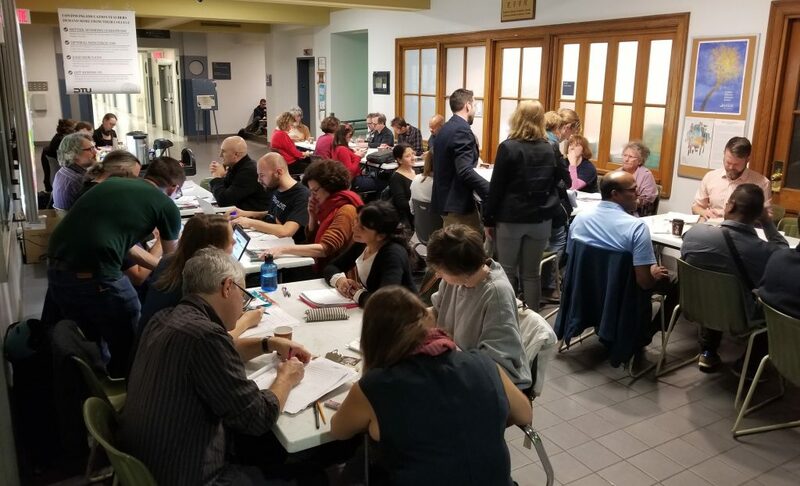 The “Comité ad hoc sur la « situation des chargé-es de cours depuis les quatre dernières négociations »” presented their report to the Regroupement which prompted a spirited debate regarding the need to prioritize the negotiation demands pertaining to Continuing Education teachers. For the DTU Executive, it highlighted the importance of a strong mobilization by the cégeps who represent the largest portion of hourly-paid teachers. 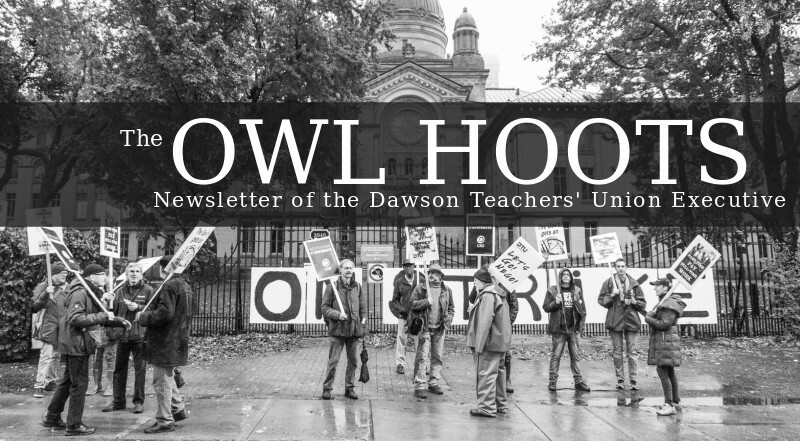 Dawson teachers from all sectors have been leaders in the fight for better working conditions in the hourly-paid sector and we hope this trend will continue as negotiations approach. We may invite Cont. Ed. teachers to come to some future Regroupements to share their experiences. Our goal is to sensitize other delegates to the realities of teaching in Cont. Ed. and to highlight the impact of expanding Cont. Ed. programs in urban centers on the survival of rural cegeps. In order to keep Cont. Ed. issues front and center during the upcoming negotiations, we are re-mobilizing the Cont. Ed. Mob. Committee. The first meeting is Tuesday, February 5th at 4pm in 7C.5 (Rose Lounge). All Cont. Ed. 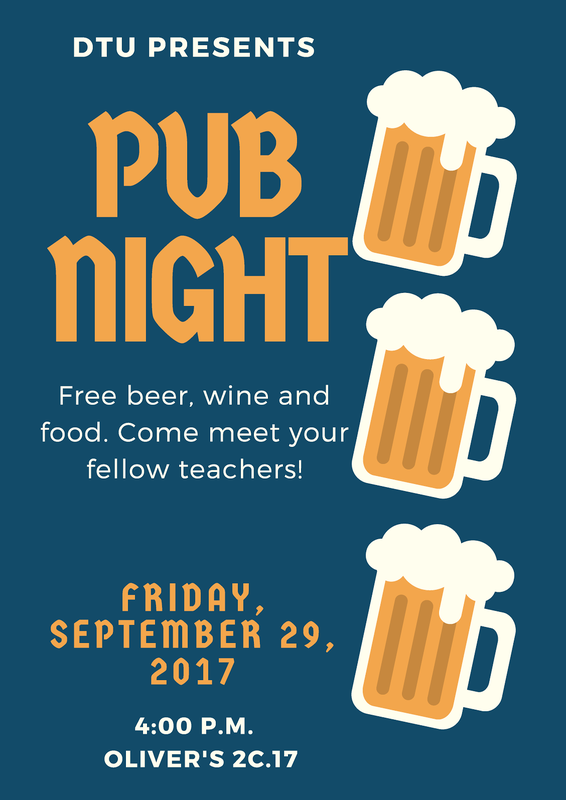 teachers are welcome! 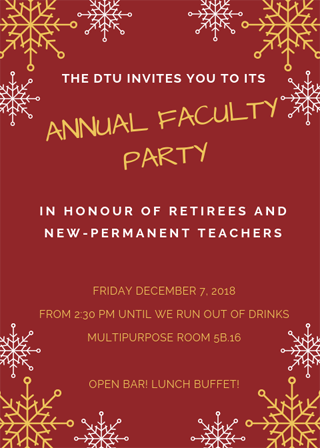 Please RSVP to dtu@dtu.qc.ca so we can make sure to have enough food. At the end of last semester, the Women’s/Gender Studies group passed a motion denouncing the lack of consultation involved in the development of the Bill 151 Policy to Counter Sexual Violence. This motion was passed at the DTU Executive Council and at many department meetings. 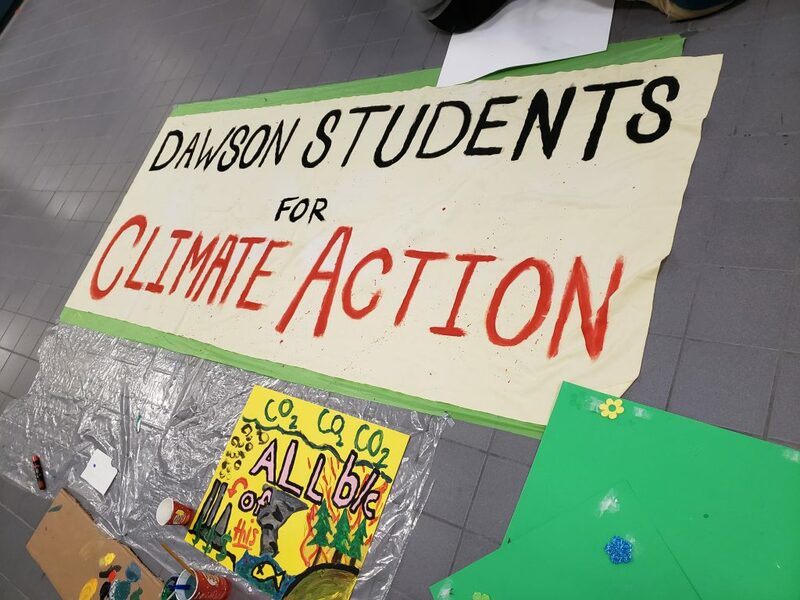 Following this pressure, the policy was released to the Dawson community. The Standing Committee has been formed which met on January 22nd and agreed on a process for the next steps in the consultation process. Consultation with the various unions, student groups, and some faculty groups will be starting soon, with a planned large-scale consultation for Faculty, Professionals and Support Staff, and Students to take place in March. The final policy will be presented to the Board of Governors for adoption in April. We would like to remind you of your rights with respect to the evaluation of student work, in particular in the case of grade reviews. According to our Collective Agreement, only a student`s teacher or a Grade Review Committee (GRC) may modify a student`s grade (clause 8-1.02). The Academic Grievance Committee defined in the Institutional Student Evaluation Policy (ISEP) does not have the authority to modify grades, nor may it constrain the deliberations of the GRC. Further information on Grade Review and Academic Grievance Committees can be found here. The DTU Executive invites you to drop by room 8A.11 for questions regarding workloads, seniority and priority, schooling and work experience, or anything else related to life at Dawson. You can also call us (x1799), or email us (dtu@dtu.qc.ca). For your request to be considered at the next meeting of the Professional Development Fund Committee, submit it by the 21st of September. You can drop your application off in room 8A.11 or email it to pdfsecretary@dawsoncollege.qc.ca. Applications must be submitted prior to the date of the proposed activity. Given Dawson’s failure to address the precarious working conditions in Cont’Ed, we will be holding a General Assembly to mobilize for change. 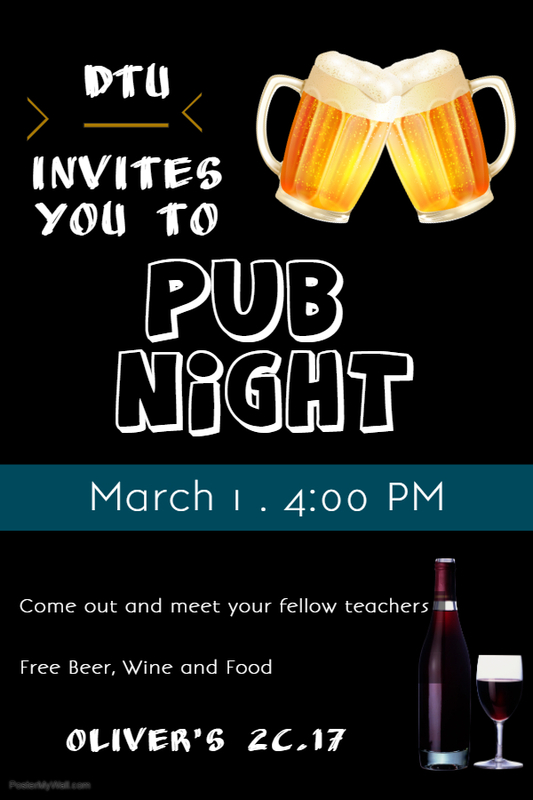 All teachers are encouraged to attend. Join us at 3pm in the board room (5B.13). We encourage you to consult the DTU before you refuse any workload you have been offered. Refusals can have a substantial impact on your future hiring priority. 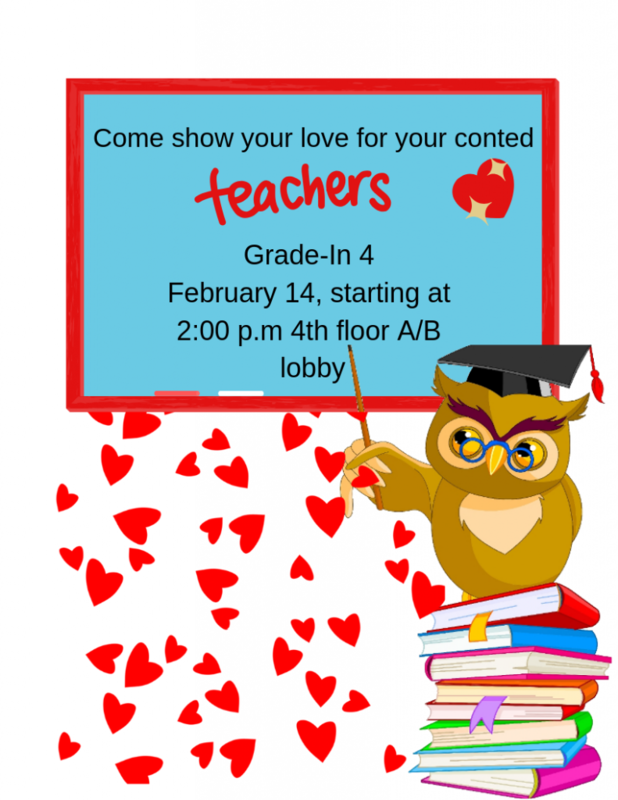 Teachers who would like to learn more about seniority, priority, and workload distribution are welcome to stop by the DTU office in room 8A.11, or to send us an email at dtu@dtu.qc.ca. Note that long-term disability insurance enrollment is automatic once you acquire permanence or at the beginning of your fourth full-time contract, whichever comes first. We strongly encourage you to check your pay stub and to contact us with any questions you might have about it, especially if you think you’ve noticed a discrepancy. The collective agreement tasks each department with selecting its future members. The department selection committee recommends candidates to the College for hire. Each selection committee must consist of three faculty members from the department and two College representatives. Recommendations to the College must be based on professional competencies and on pedagogical aptitude. In the event that the committee recommends multiple candidates, it is essential to rank the candidates. This ranking determines their initial hiring priority. If the committee unanimously recommends a candidate, the College must hire them. A majority recommendation from the committee does not bind the College to hire the candidate. Finally, the College cannot hire a candidate without at least a majority recommendation from the selection committee. We ask teachers to inform the DTU if any member of a selection committee invokes affirmative action or access to employment in the ranking of candidates. While selection committees are bound by the recommendations of the affirmative action committee, the College has neglected to convene this committee for a very long time. We also ask teachers to inform the DTU if a selection committee is improperly constituted, or if a College representative attempts to veto a majority decision. Both Regular and Continuing Education faculty are eligible for special leaves without loss of pay under clause 5-9.01 of the collective agreement. These include short-term leaves for the death of your spouse or a family member; for your wedding or a wedding in your immediate family; for moving; or due to an act of God preventing you from working. All teachers also benefit from up to ten days of leave for family reasons per year under clause 5-9.06. These leaves may be used for any obligations arising from the care or education of your child or your spouse’s child, or from the health of a spouse or a close relative. Up to six of these days may be claimed from your sick bank, if applicable. Half-day leaves are also possible. Extended leaves for family reasons are available in exceptional circumstances. Feel free to contact the DTU for more information. If you need to avail yourself of one of these leaves, you must inform your sector dean in writing as soon as possible. You are encouraged to copy the DTU in your correspondence (dtu@dtu.qc.ca). Last January, eight Continuing Education teachers from the French department wrote to Richard Filion (Director General), Diane Gauvin (Academic Dean), Andréa Cole (Dean of Creative and Applied Arts), Pascahl Scott (Director of Human Resources), and Johanne Rocheleau (Dean of Continuing Education and Community Services) denouncing their unequal working conditions, discounted salaries, and lack of sick days. They implored their administrators to take action. Below are two excerpts. As of September 6 — nearly eight months after they reached out — they have yet to receive a response. “As the semester begins, I would like to remind the administration that Conted teaching conditions are inequitable. 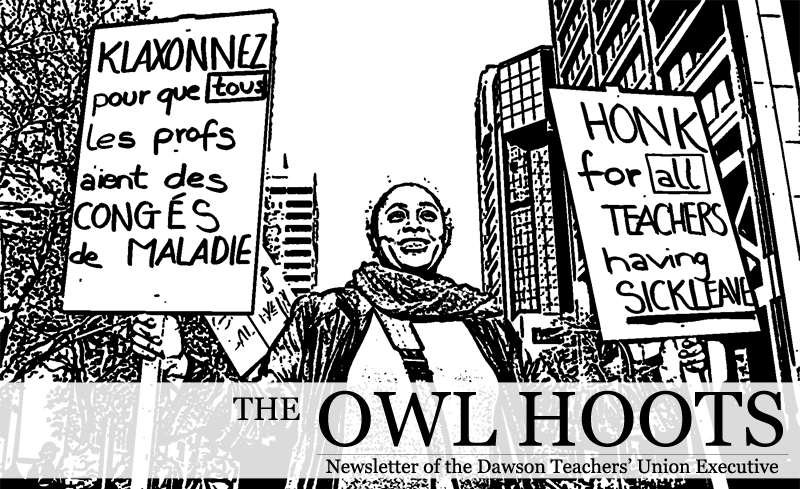 I have been working at Dawson since 2008 and as a French teacher since 2012. While I am proud to be part of our inspiring community, I cannot help but be disappointed by the difficult working conditions that my Conted colleagues and I continue to face. We have no sick days; no vacations; no paid support hours to offer our students; our pay is significantly unequal to our workload; and our classes are often confirmed days (or sometimes even hours) before they start. Conted welcomes more and more students as its ratio in relation to day classes keeps increasing. However, no one is acknowledging our importance in the Dawson and Cegep communities or is ready to give us the conditions we deserve. After six years of teaching at Dawson, both night and day, I am still faced with an uncertain professional future. I have since become a mother and the prospect of having to work nights for many more years to come (at almost half the salary of my daytime colleagues) is a daunting one. Without access to sick days, I cross my fingers that neither my son nor I will fall ill during the semester. Reconciling work and family is a constant struggle for a Conted teacher. “[This] August will mark the end of my fifth year as a member of faculty, and still I teach full time at Continuing Education. I hold a PhD from UQAM and I have been teaching in post secondary education for the past thirteen years. This year, my projected salary at Dawson is 38 280$. If I was teaching full time in the Day Division, teaching the exact same courses to the same number of students in the same classroom, I would be making 82 909$, with sick days and benefits. The reason why I am writing today is to express my indignation at the ever worsening conditions of my employment. When I was first hired, I was told that teachers will stay at Cont’Ed for a year or two. At the time, I had other opportunities, with two Montreal universities concurrently hiring me as a lecturer, but my spouse and I decided that I would prioritize Dawson, because, in time, Dawson could offer me what a lecturing position never would : financial stability and permanence. At the time, our 6 month-old son was in the NICU and we were about to receive a diagnosis that would change our lives : he had MEDNIK syndrome, a life-threatening condition, which, if he were to survive, would rob him of the ability to walk, talk, and feed himself. With my being hired at Dawson, my spouse and I breathed a sigh of relief, as we felt like we could put a lot of our financial and material anxiety to rest. The DTU Executive invites you to drop by our office in room 8A.11. We can answer your questions regarding workloads, seniority and priority, schooling and work experience documentation, and anything else related to working at Dawson. You can also call us at extension 1799, or email us at dtu@dtu.qc.ca with your questions. We are in the process of rolling out our new website at www.dtu.qc.ca. We’ve done our best to provide as much information as possible, and to streamline navigation. Feedback is welcome! If you want your request to be considered at the next meeting of the PDF committee, make sure to submit it before September 14th. You can drop your application off in room 8A.11, or you can email it to pdfsecretary@dawsoncollege.qc.ca. Please note that your application must be submitted prior to the date of the proposed activity. We strongly encourage you to check your paystub and to contact us with any questions you might have about it, especially if you think you’ve noticed a discrepancy. Teachers who were on leave (sick leave, parental leave, or other) in 2016-2017 should verify their vacation pay. The DTU can help you determine whether an error has been committed. Note that long-term disability insurance enrolment is automatic once you acquire permanence or at the beginning of your fourth full-time contract, whichever comes first. The following is how the College allots your sick days. When a teacher is first hired into the Regular sector — and only then — six (6) sick days are automatically added to their sick bank. Every teacher, regardless of their workload, is credited with these six days. Every year on September 1, seven (7) sick days are credited to each full-time Regular sector teacher; for part-time teachers, that number is prorated to their workload. These seven days constitute your ‘current sick days’ for the year and are not cumulative. However, if the total number of sick days in your bank is less than or equal to thirteen (13) on June 30, your unused current sick days are added to your sick bank. (No unused current sick days are added to your bank if you have more than thirteen sick days in your bank.) Unused days cannot be converted into cash. If you take a leave (other than a parental leave or a sick leave), the seven current sick days are adjusted on a prorata basis to the impact of the leave on your availability. WHAT SHOULD I DO IF I’M SICK? You must notify the College (your Sector Dean’s office) as soon as possible, and you must identify exactly which classes have to be cancelled. Each Dean has a phone number dedicated to absences, so you can call anytime. Your absence will be posted on the Cancelled Classes board and on the College website. Upon your return to work, you will need to fill out a Certificate of Absence as promptly as possible. The form is available from Human Resources (4B.7), from your Sector Dean, and on the Dawson website (in the ‘Online Forms’ section). Clearly indicate on the Certificate of Absence whether you were unavailable for only half of a day (e.g. for a medical appointment). The College may request that you provide a medical certificate any time that you take a sick day. However, it usually does not do so unless your absence extends beyond five (5) days. If the College requests a medical certificate from a teacher absent for fewer than 4 days, it is at their expense. The first five (5) consecutive days of absence are paid at 100% of your salary, provided you have enough sick days available in your sick bank. If you have no sick days remaining, then you are simply not paid. After five working days of illness, you are placed on salary insurance (also referred to as short-term disability insurance). Subsequent sick days are paid at 85% of your normal salary for the first year, and at 66 2/3% for the second year. Note that during your sick leave, you are exempt from paying RREGOP premiums, and your long-term disability and life insurance premiums are waived as of the 30th day of your illness. After this two-year period, you may be eligible to collect benefits under our long-term disability insurance policy, which is optional for most non-permanent teachers but compulsory for permanent teachers. If you do not have long-term disability insurance, you will not receive any income. Your health insurance premiums will also be waived once you become eligible for long-term disability benefits. Neither short-term nor long-term disability insurance affects your sick day bank balance. You have the right to be absent from work for up to ten (10) days per year to fulfill obligations relating to the care, health or education of your child or your spouse’s child, or for health reasons related to your spouse, father, mother, brother, sister or grandparent. You can use up to six (6) sick days for these absences. The remaining four (4) are without pay. These days may be divided into half-days. You must inform the College of your intention to avail yourself of these days as soon as possible.